SURROGATES: My Idealized Self Is Kind Of Dull, Too – Schlockmania! Hollywood’s latest stab at the tech-driven “high concept” thriller goes through the motions in slam-bang style and still manages to feel dead-on-arrival. 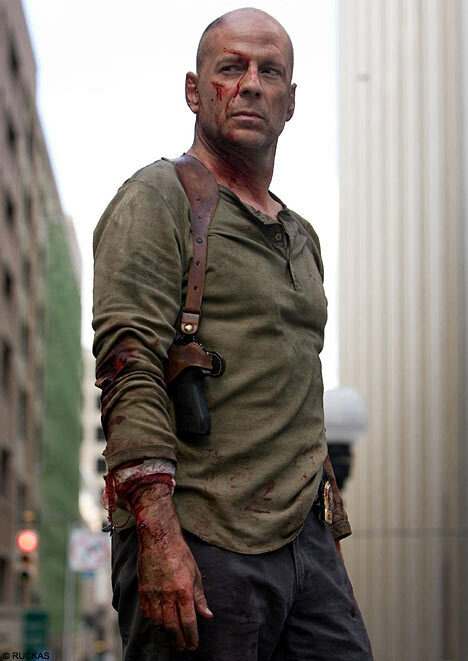 In Surrogates, Bruce Willis plays his umpteenth variation on The Grizzled Cop Haunted By A Tragic Backstory in a future where the majority of human life functions are fulfilled by the title devices, super-high-tech androids that allow people to experience all the sensations of life without any of the pain or danger. Unfortunately, there are people who are unhappy with this state of affairs and one of them has created a zap-gun that not only fries surrogates but also melts the brains of their users into puddles of warm tapioca. Willis and his partner (a typically professional Radha Mitchell) are plunged into a future-shock detective story, trying to retrieve the weapon as they deal with the reclusive inventor of the surrogates (a sleepwalking James Cromwell), a luddite cult leader in dreads and a bushy beard (Ving Rhames, also sleepwalking) and the obligatory Corporate and Military Conspiracies. If that plot summary sounded rather ‘by the numbers,’ rest assured, it is. This is the inherent problem of Surrogates – a fascinating high-tech conceit with lots of promise is used as window-dressing for the most simplistic and banal of detective stories. It is based on a comic book but I imagine the source material was heavily simplified to reach the lowest-common-denominator storytelling we get here. The plot is populated with so few characters that guessing the big plot reveals doesn’t take much effort and the character-backstory stuff for Willis’s character is rote that one can practically finish his dialogue for him when he opens up about his secret traumas. Plot twists that are supposed to make the audience gasp instead inspire shrugs of “oh, it’s really that simple?” disappointment and the way the film’s technology works will make anyone with scientific or computer-related knowledge tear their hair out in frustration (seriously, high technology hasn’t been this stupid in design and execution since Eagle Eye). To make matters worse, the story fails to work in the kind of interesting details that could have distracted from the story’s many problems. For instance, Willis looks very similar to his surrogate. The only differences are Real Willis has a goatee and Robot Willis has a crappy toupee (what the hell kind of future is it where your idealized self can’t get a semi-convincing head of hair?). The story would have had an extra level of interest if Willis’s robot self was the bete noire for a Paul Giamatti-style schlub and the other characters had a similar level of disconnect between their human and robot selves. When the story does make efforts to provide such details, the result are either predictable – a low-rent surrogate shop owner acts like a used-car salesman – or unintentionally funny, like a scene where surrogates get high at a party by zapping themselves with a bong-shaped cattle prod. That said, Surrogates isn’t unwatchable. Director Jonathan Mostow provides sharp pacing, the expected visual gloss and handles the frequent action setpieces with a craftsman’s skill. The film’s fusion of CGI, animatronics and prosthetic effects is pretty seamless throughout and sells the film’s technical concepts better than the writing does. Finally, and most importantly, Willis navigates his characterization with the skill of a movie star (as usual, he’s better than his material and his work makes one wish he’d pick better scripts). That said, the sheer competence of this enterprise can’t overcome its woeful shortcomings in the inspiration, complexity and ambition departments. 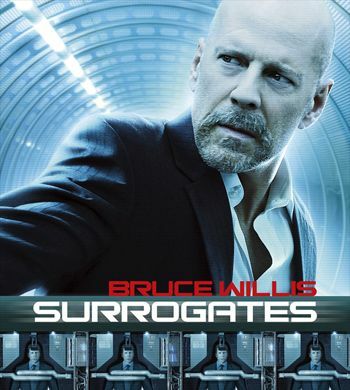 As a result, Surrogates ends up feeling like a really overpriced straight-to-video flick.